Update: Windows 10 has been released to the public as a free upgrade on July 29, 2015. All emoji updates listed below are included. Windows 10 is now the first major OS to support the Middle Finger Emoji, Slightly Smiling Face Emoji and Slightly Frowning Face Emoji. Skin tone modifiers, the middle finger, and a sassier information desk person are amongst the emoji updates in Windows 10. Some may be surprised to learn that emoji support on Windows is not new. It dates back to 2012, with the release of Windows 8. The lack of support for emoji when using Chrome for Windows may be a factor in this. July 2009: Windows 7 is released, with no emoji support. Emoji only becomes included as part of the Unicode Standard in 2009, and is not in any form of widespread use outside of Japan. October 2012: Windows 8 is released, which includes emoji support out of the box; but only in black and white. Windows 7 receives an update which installs the same Segoe UI Symbol font used in Windows 8. October 2013: Windows 8.1 is released, which includes support for color emoji for the first time, provided by a new Segoe UI Emoji font. This uses the same images as Windows 8, but shown in color for the first time. July 2015: Windows 10 is to be released. This is the first update to emoji characters since Windows 8.1 in 2013. There has been a lot to catch up to do in the past 18 months. 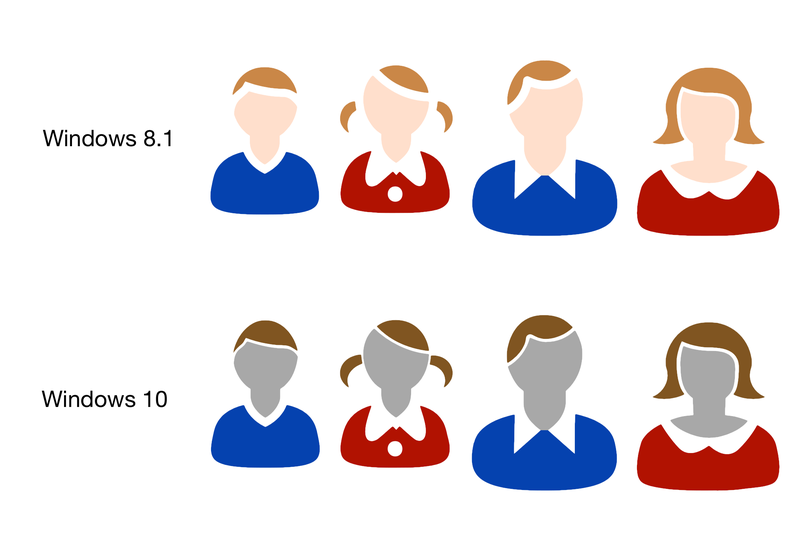 Taking on board the Unicode recommendation that the default skin tone of emoji people should be generic (nonhuman) in appearance, Windows now displays gray-skinned people as the race-neutral default. This is used when no specific skin tone is chosen. A choice of skin tones is available for most human-looking emojis, which fall into the previously discussed range of five skin tone modifiers. Many human emojis in Windows use the bald-man (?) character, which neatly avoids the issue of hair color altogether. Left-Right: Person With Folded Hands shown with default appearance, pale, cream white, moderate brown, dark brown, and black skin tones. 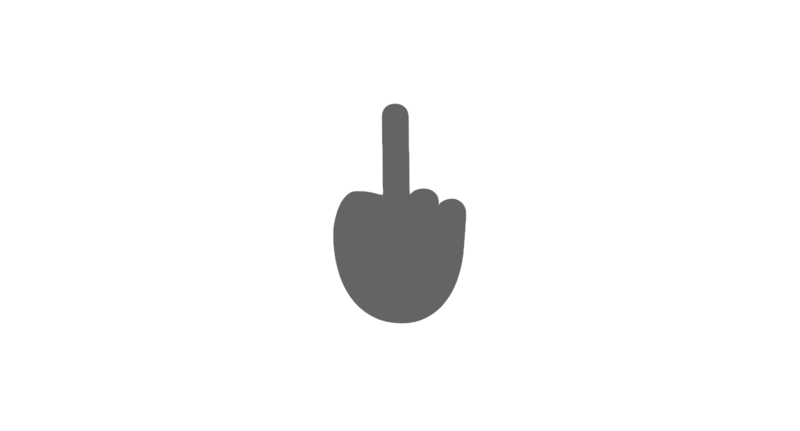 The middle finger emoji was approved as part of Unicode 7 in mid-2014, yet has curiously remained absent from iOS, OS X, Android, and Windows. Until now. If this is not expressive enough, a range of skin tone options exist from the pale middle finger, through to the black middle finger. Above: Middle Finger Emoji shown in default gray, next to the diverse skin tone options. Less likely to grab headlines are some of the more subtle changes to the emojis included with Windows 10. Most of the following updates focus on bridging the gap between how some faces appear on other platforms, and how they appear on Windows. 😤 Face With Look Of Triumph now directly matches its counterpart from Apple and Google. 💁 Information Desk Person now resembles Apple's iconic version of this emoji, showing a woman with her hand out to one side. Often used as a sassy emoji, Microsoft ups the ante by giving her a wink. Too much? 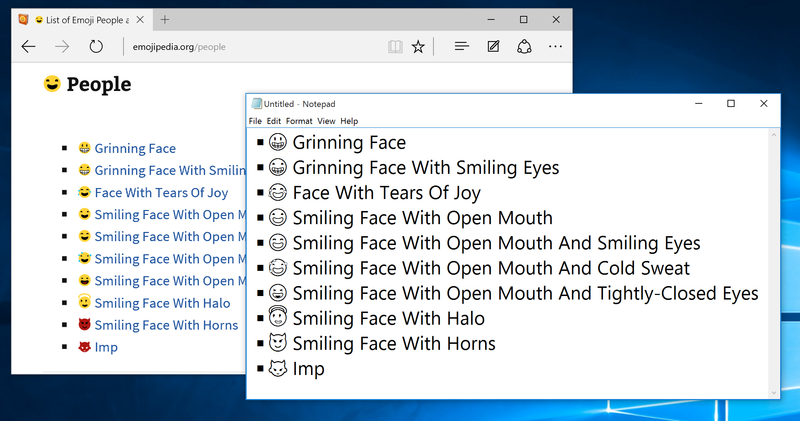 The full set of Unicode 7 characters are supported on Windows 10, but only the five above-mentioned emojis are given an emoji presentation. The rest appear to be black-and-white (text-presentation) glyphs brought over from Webdings. 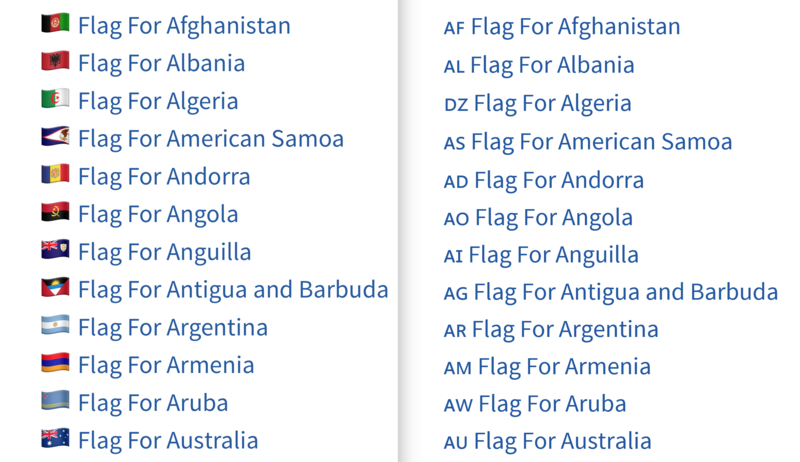 Flags remain unsupported on Windows, which instead displays the two-letter regional code for each country. Left-Right: Emoji flags on OS X, two-letter regional codes on Windows 10. Support for different family combinations (two mothers or two fathers) and same-gender couples is also absent from this update. 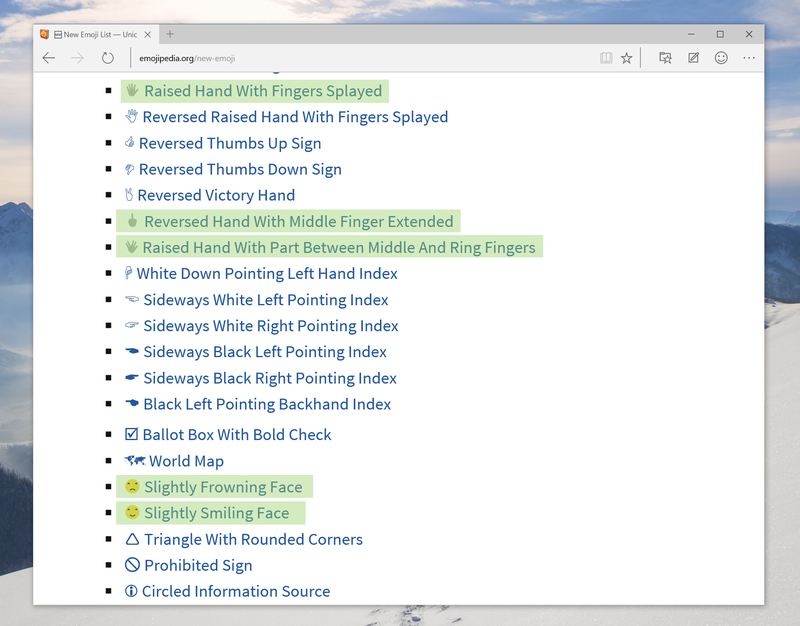 Support for color emojis in Windows 10 is limited to the new Microsoft Edge browser, and these only appear when the specific color emoji font is specified. As such, it's not uncommon to see the black and white (text presentation) variants of these emojis across many websites and in other apps, which may limit their appeal. By comparison, OS X defaults to the color emoji font when a color emoji is used, regardless of browser or font. For users, this is a more consistent implementation. For emoji fans, Windows 10 is a decent update from Windows 8.1, but plenty of room for improvement still exists.